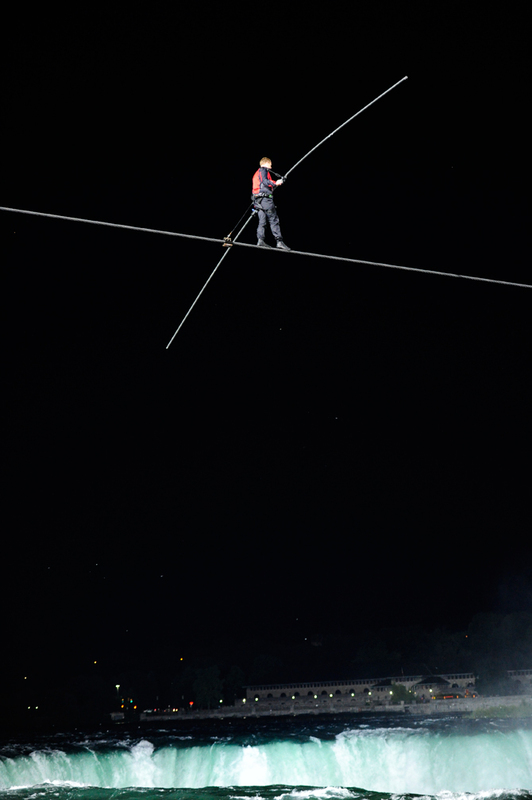 Friday night, with the eyes of the world watching, daredevil Nik Wallenda successfully walked a high wire across Niagara Falls. 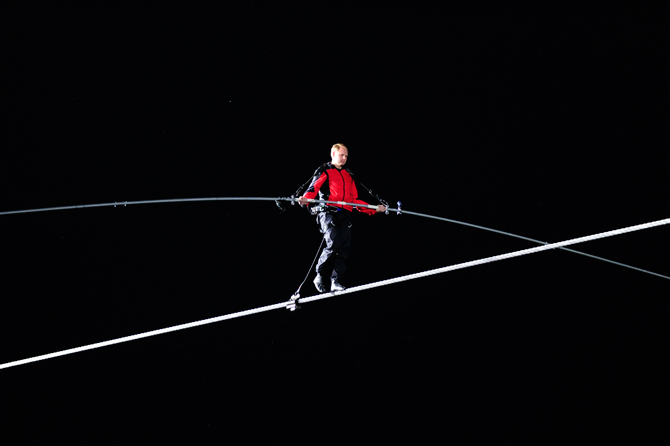 Wallenda began his trek from Niagara Falls, N.Y., at about 10:15 p.m., and finished about 10:45 p.m. in Niagara Falls, Ontario. 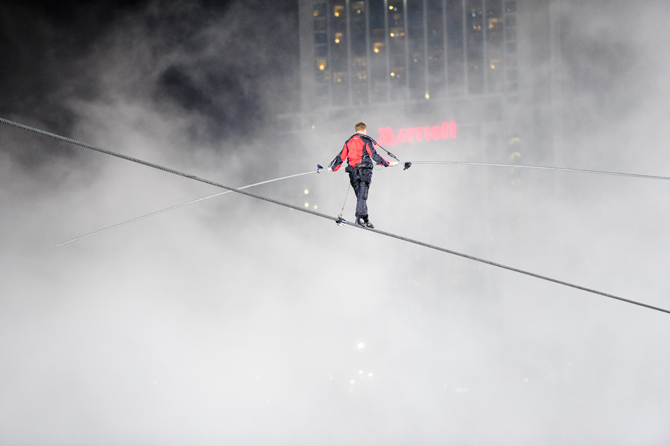 "The mist was so thick, so challenging, those winds hit me from every which direction, was definitely more than I expected for sure," Wallenda told Bullet News Niagara. "I was very focused, the wind was definitely something you could not train for. The mist was powerful, the mist was in my eyes." Bullet's Peter Conradi wrote that, "Upon his arrival in Canada, Wallenda, drenched with water and looking exhausted and relieved, was met by Canadian Border Service Agency officers who asked to see his passport. 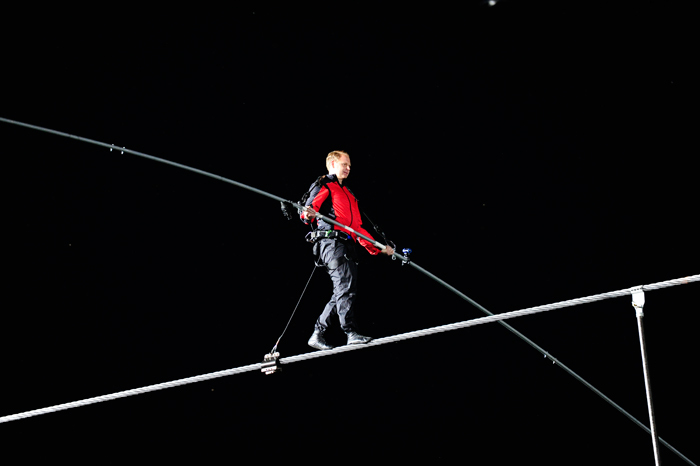 When asked what the purpose of his trip to Canada was, Wallenda replied "to inspire others." "I'm so blessed, the amount of people that have watched this has been just breathtaking," he said. 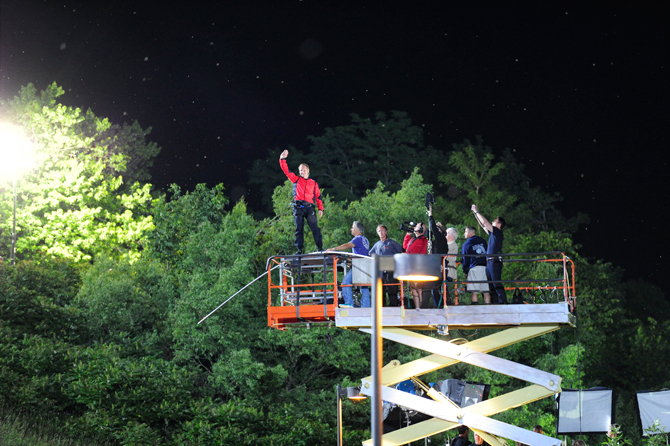 On the American side, numerous activities took place throughout the afternoon and evening to mark "Wallenda Day." Old Falls Street was abuzz with activity, and nearly every parking space in the downtown area (not to mention flat, open ground) was used, as thousands of people gathered to watch Wallenda walk. At Terrapin Point, more than 4,000 ticketholders lined up to watch the show. 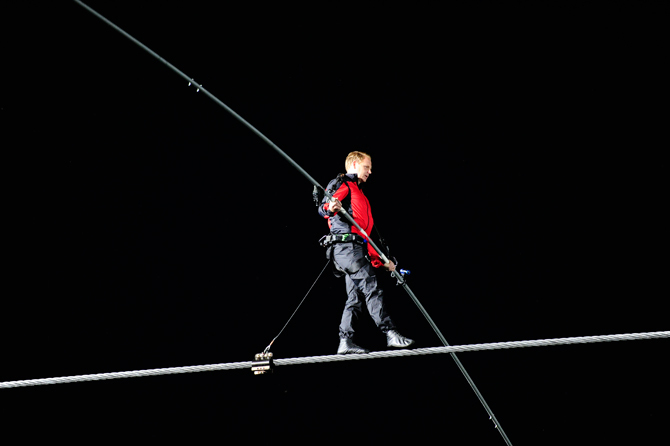 The crowd cheered Wallenda on as he took to the wire, walked across the water, and then landed safely across the border. More than 50 news outlets - from locations including Brazil and Japan - were on hand to watch the historic event. ABC aired the wire walk live as part of a three-hour "Mega Stunts" event.